Being in a wheelchair may seem challenging at first, but over time you will start to become adjusted to this new lifestyle. 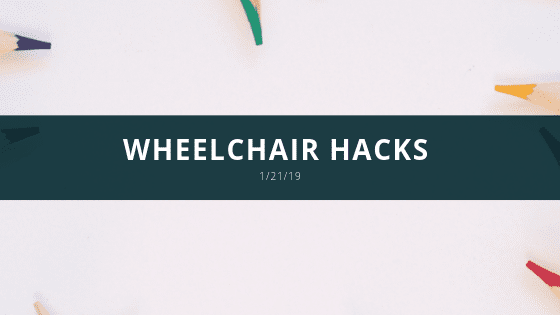 We have researched some of the best wheelchair hacks for traveling, cooking, and other everyday activities. Make sure you have a phone holder, a chair chargers that connects to our chair’s batteries (if chair is not electric, then consider investing in a portable charger), and a chair charger bolted onto the back of the chair. Suitcases with spinner wheels, this allows you to push and pull the suitcase inby the handle at any angle. Websites like seatguru can help you book your seats on flights. They have seating charts for most plane designs. Bed Assist Straps can help you maneuver in and out of beds that you are not used to. It has several built in handles, like a rope handle. Invest in ultralight travel ramps for long road trips. These ramps are made of carbon fiber which makes in strong but very light! Some can handle 600 pounds while only weighing in at 8 pounds. Invest in a lap desk. They are stable and accessible preparation surfaces. You can mix in small bowls and protect yourself when moving hot objects such as pans and baking sheets. This can also help you carry things around the kitchen like a tray would. Use small containers to make things easier to hold and open. Smaller containers can be more comfortable to use. Zipties can be used around the refrigerator and cabinets to extend your reach if you are unable to adapt your kitchen. Non Slip drawer liners will keep objects from moving or sliding around. This will lower your risk of injury when reaching for objects in hard to reach places. Attach keyrings or safety pins to zippers to help you zip jackets and bags. Touch lamps, which are lamps that only require a light tap or touch to turn on, off, and adjust. You can always attach strings to pull lamps but touch lamps can be useful if you have limited upper mobility while being aesthetically pleasing at the same time. Incense sticks can make lighting a candle a simple task again if you have limited dexterity. Plastic bags can be extremely useful for many people with physical disabilities. For instance, powerchair users can use them to protect their chair’s joystick in the rain. Keep or attach a good flashlight when traveling don dark sidewalks to light your way and help lower the chance of being suddenly attacked.